Eunimart is a Singapore based startup working in the space of cross border ecommerce focusing on solving the challenges faced by merchants looking to sell globally; they are an ecommerce enabler and not a marketplace – they help SME merchants to sell through ecommerce marketplaces like Amazon, Ebay, Daraz, Lazada etc. Eunimart’s vision is to become The Platform of choice for SMEs and brands looking to sell globally through Ecommerce. This enables cross-border E-commerce through a unified tech-platform powered by Artificial Intelligence. Eunimart has grown significantly in the last year with orders growing 23X and GMV growing 26X. Currently Eunimart works with 18 international ecommerce marketplaces, 10 shipping partners, payment partners, etc. providing access to 80+ countries on one platform. Eunimart’s business model of AEIOU (Access, Ecosystem, Intelligence, Operations and Unified Platform) is its USP. 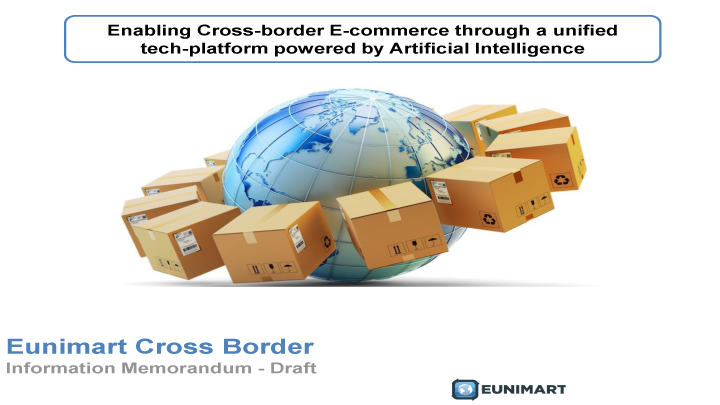 Today, Eunimart seeks to consolidate its business in India and partner with potential business partners from countries where the scope of crossborder ecommerce is growing. Eunimart has identified demand in several markets such as Australia, Indonesia, USA, etc and their global partnership network provides them with an unique opportunity to expand without having to invest in these markets.